Decorticated Almond "The star of nuts because of its sweetness and health benefits! A nutritious snack against the feeling of hunger." 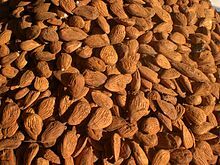 - The almond is rich in minerals and helps reduce the rate of "bad" cholesterol. - A team of Chinese and American researchers has shown that eating a handful of almonds every day increases its free radical defenses and decreases the oxidative stress caused by substances in tobacco smoke. - Almonds also contain large amounts of vitamin E, fiber, antioxidants and unsaturated fatty acids, all substances beneficial to health.